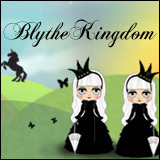 BlytheLife.com » One Short Day in the Emerald City! As many of my fellow Canadians know, postage rates from Canada to pretty much any where (including Canada!) is rather… astronomical. 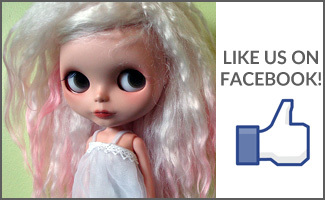 It was not financially savvy for me to ship anything down to the BlytheCon Seattle organizers for the goodie bags because even though the items I had to give away would have been light. The workers at Canada Post takes bulk into consideration as well, regardless of how lightweight something is. Unfortunate, I know. I really wish that it was cheaper, but it just wasn’t worth it to ship any of it because the cost just wasn’t feasible. I’m not made of money (unfortunately? surprise?). I will have this bag with me! 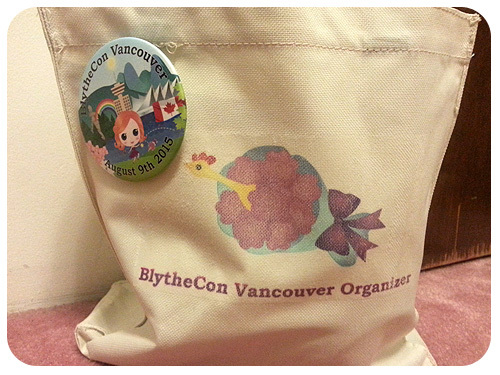 I will have BlytheCon Vancouver buttons to give away if you come to say hi to me. 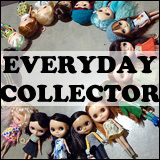 If you mention this blog or the name BlytheLife, I may have extra goodies for you. 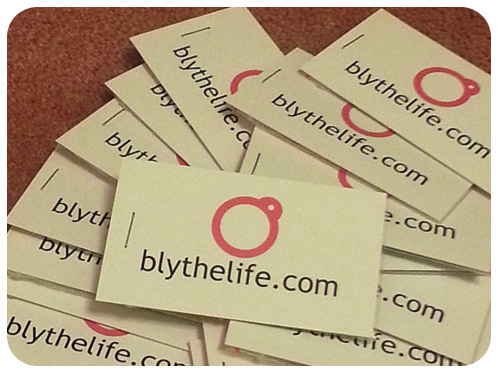 And if you have Moo or other business cards for trade or to give away, I’ll have some cards for you too! For those curious, and not into musicals, One Short Day is the name of a song from the musical Wicked when Elphaba (the Wicked Witch of the West) and Galinda (later known as Glinda) visit the Emerald City for the very first time. I’m sad I am unable to go. I can’t wait for all the pictures to show up online!